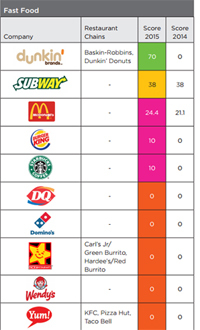 Yum Brands - the parent-company of fast-food brands KFC, Taco Bell and Pizza Hut - has committed to 100% sustainable palm oil for the first time following pressure from environmental activists. Yum has an existing nutritional policy to remove palm oil from its cooking process by 2017, but says the new commitment will commit any "exception markets" to 100% sustainable palm-oil by the same year. The announcement was made on the same day as Yum was identified as the least responsible major palm-oil user in a report by the Union of Concerned Scientists (UCS).The timely switch lends weight to the UCS' conclusion that "consumer pressure to change the palm oil industry is working". The palm-oil announcement was made in the Yum's latest CSR report, which also revealed 97% progress towards reaching a 15% reduction in energy consumption between 2006 and 2016. The environmental impact of this efficiency upgrade has been "significant" according to the report with an accumulated reduction of almost 1.2 million metric tons of CO2 since 2009. The report stated: "More efficient technologies for lighting, air conditioning, and refrigeration continue to be developed and we carefully evaluate and apply these technologies when they provide the right balance of environmental and economic benefits. Progress on water consumption has been slower than expected as the company is 37% of the way to a 2015 target of reducing water-use by 10%. "It's impressive to be able to report that we've saved 577 million gallons of water over the past nine years, but recognizing this is 37% of our target energizes us to keep working to find even more ways to achieve our goal," the company added. The Kentucky-based firm also reported no figures for its recycling, despite the vast amount of paper-based packaging used in serving its products. "We are in the process of establishing our 2020 goal for waste and recycling, which will provide more measureable and robust targets for our brands globally." Find out more about Yum's policies and plans in individual countries, including the UK, here.